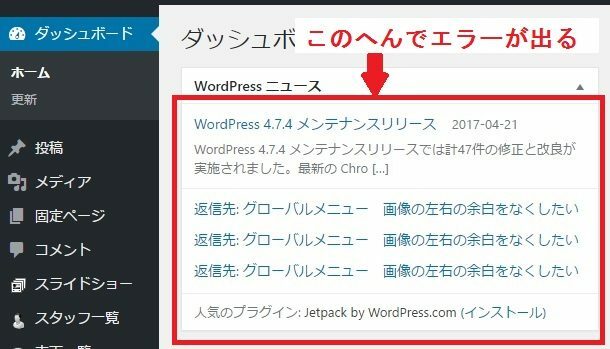 RSS エラー: A feed could not be found at https://ja.forums.wordpress.org/rss.php. A feed with an invalid mime type may fall victim to this error, or SimplePie was unable to auto-discover it.. Use force_feed() if you are certain this URL is a real feed. //ドキュメントルートで以下コマンドを実行。-nで行番号。rで再帰的。ドットは現在のディレクトリを示す（ここにファイル名などがくる） grep 'https://ja.forums.wordpress.org/rss.php' -rn . //grepで2語検索（and検索） grep -rn hogehoge . | grep hugahuga . grep -rn hogehoge . | grep hugahuga .